The college football season is just three days away, and it might be the beginning of the end for these Power 5 conference coaches unless they step up this fall. 10. Gary Andersen (Oregon State): Good news: Oregon State beat Oregon last fall for the first time since 2007. Bad news: The Beavers have won just five other games in Andersen’s two years in Corvallis. 9. Dave Doeren (NC State): Mediocrity will only be tolerated so long, even at NC State. After three straight 3-5 ACC records, Doeren and the Wolfpack need a breakout 2017 season. 8. Bret Bielema (Arkansas): Bielema was supposed to be the hire that got the Razorbacks back competing for SEC titles. Instead, he’s gone just 10-22 in conference in four very average years. 7. Kliff Kingsbury (Texas Tech): Just 24-26 at his alma mater, Kingsbury’s good looks won’t save his job if the Red Raiders rank dead last in FBS defense again. 6. Butch Jones (Tennessee): Tennessee might be champions of life, but the Volunteers haven’t won the SEC East in a decade. If the Vols regress this season as expected, Jones could be out. 5. Jim L. Mora (UCLA): After a promising start in Westwood, Mora’s tenure at UCLA went off the rails last season with a 4-8 record. UCLA has plenty of talent, now it’s time for the Bruins to live up to it. 4. Rich Rodriguez (Arizona): It feels like just yesterday that Arizona was playing in the Pac-12 title game. But after 15 losses in the last two seasons, RichRod’s early success in the desert is starting to look like a mirage. 3. Todd Graham (Arizona St.): Scoring has never been a problem for Todd Graham teams. It’s an abysmal defense that’s led to two straight losing seasons in Tempe. 2. Kevin Sumlin (Texas A&M): It’s been the same story in College Station the last three years: Start hot and get ranked in the Top 10 only to limp down the stretch and finish 8-5. It better not happen a fourth time. 1. 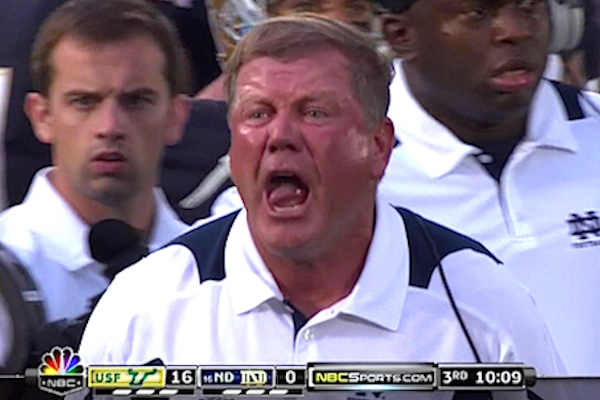 Brian Kelly (Notre Dame): Notre Dame doesn’t want to pay another massive buyout like it did for Charlie Weis but Kelly’s leash is very short after a disastrous 4-8 season in 2016. Facing a brutal schedule, he likely needs 8 wins to be around in 2018.